Review: The last major story arc of Frank Castle the Punisher published by Marvel's MAX line takes Frank and puts him in the middle of a horror film scenario a la The Hills Have Eyes or Texas Chainsaw Massacre with a bit of Deliverance thrown in. Frank ends up encountering a bunch of horror movie redneck cliches and deals with them the only way he knows how. Most horror stories in this vein are considered frightening because the protagonists are usually foolish or ill-equipped to deal with the terrible situation unfolding before them. With the Punisher however, that's certainly not the case, and we the reader never truly fear for Frank Castle's life, knowing that he will easily best them all by the end. The story was surprisingly compelling, however, even though it wasn't remotely original and I knew exactly how everything would turn out. 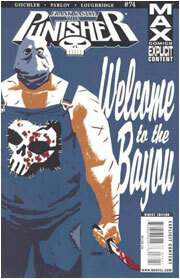 There's always a certain joy in seeing the Punisher mete out his harsh justice, and even though the story was extremely predictable, it was a nice change of pace to see Frank dealing with inbred hillbilly scum in the Louisiana Bayou rather than the usual gangsters. It's always satisfying to see the hunted become the hunter (at least when they're competent and not annoying). Just about every cliche you could imagine was present: the redneck "family" had an attractive female among them who didn't seem to fit in with the others but was a tremendous mental degenerate and hung around with them anyway. There was the cruel, fat patriarch who decided they were going to have some fun with their newest catch before they did away with him; and of course there was the oversized mutant "Junior" who just had to wear some kind of burlap mask over his face to disguise his not-really-all-that-disturbing features. And plenty of rank and file cannon fodder for Frank to mow through indiscriminately. 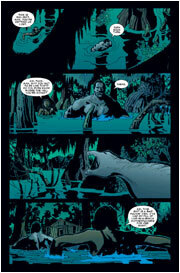 The artwork fit the swampy, dark, muddy environs of the story very well, with Goran Parlov's style well suited to drawing that kind of marshy terrain, as well as the gore and gristle required by the story. I was fairly disappointed however with the "reveal" of Junior at the end of the story. For all the build-up with the other characters talking about him, for all the mystery of his masked visage on the cover, he looked really quite tame, so I wished that Parlov had gotten a little more creative with designing that character. While this is a slight change of pace for a Punisher story, I feel that to end his long-running monthly book (it's going to be rebooted in November after one final issue to come) on an arc like this wasn't the best decision. It was an entertaining diversion, but it would have been nicer if they'd ended this book on something a little more substantial and meaningful to the titular character. This sounds really cool, I'm gonna check this out. Also... I'm just guessing of course....was junior a skrull? I haven't been able to pick up the final issue yet, but from what I've read this is a great story. Like Proto said, this story is [i]extremely[i] unoriginal, and if you can think of a cliché about cannibal rednecks of the south, it can be found in it. I guess they took a completist approach to this one. It's sort of funny in places, but meh. I'll be glad to see this title go, but they should have cancelled when Garth Ennis left instead of fobbing this last year's worth of completely pointless stories on us the readership. Am I bitter for not dropping it in time? Well, ever so slightly. Great. I messed up the italics. Now I look retarded on top of everything. Even Frank has to go out and kills some rednecks once in a while.